Frankenwald Stands upright at 44 meters depth, this 122 meter long German freighter is a truly magnificent sight. She’s still in extremely good condition after over 70 years at the bottom of the sea, and several dives are necessary to explore all her secrets. The deck lies at 24–34 meters. The bow of Frankenwald at 34 meters depth is truly a stunning sight. In good visibility, you can see all the way to the mast and bridge almost 40 meters further behind! The fore-deck is full of interesting details like bollards, winches, ventilation pipes and much more. Frankenwald was built in steel in Hamburg in 1922, and is a full 122 meters long. Although it is possible to swim the entire length in one dive, you need several dives to see and explore the whole wreck. The stern is epic and the place at Frankenwald with the most pictures ...... rest of the story you hear in Gulen. 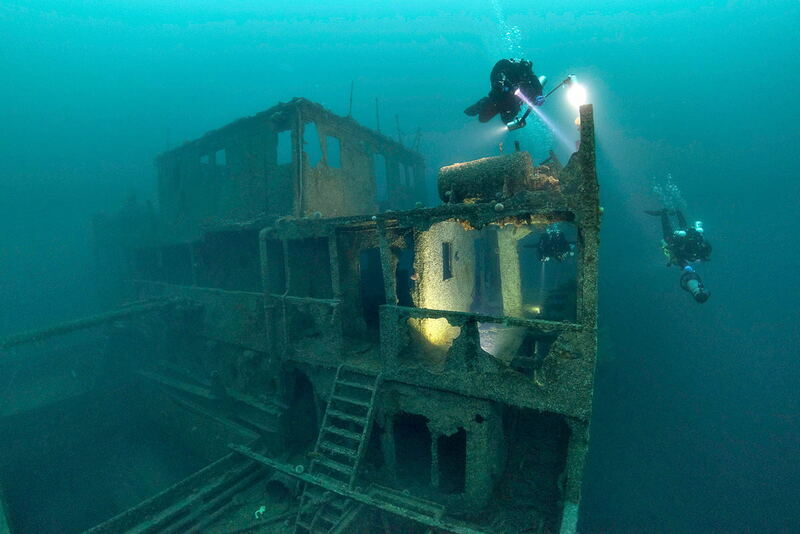 This package offers some of the best wreck dives in Europe. We have divers from all around the world, who visit us to the experience intact wrecks. Our wrecks are protected in the fjords easily accessible with good diving conditions. Currents can not be compared with elsewhere in Europe as we have almost no difference in tides. With more than 25 wrecks to choose from, we can promise you good dives in almost any weather conditions. Are you a photographer or like to shoot, you have unique opportunities. We have an average viz water at around 15-18m, where the winter months December January and February offers up to 30m. detailed explanations before dives will give you the correct information needed to choose the right lens etc. You can dive this package throughout the year with slight variations in viz, but favorable periods has very good visibility up to 30 meters + in the winter months Water temperature is highest in August with up to 22 Celsius and lowest in March with 6 celsius. Including also all that stands in the page "Booking Conditions"
We offer several lengths of stay by default, but we are flexible if you want to make changes. No need to do anything no, if you need to ad or change som dives, or type of dive, we can do that when you are with us in Gulen. Use our feedback form below if you have any questions. Read more about some spectacular wrecks, the list is an extract of more than 20 wrecks that we have in our area.